Located near the intersection of SW 147th Ave. and SW 120th St., Extra Space Storage serves Miami residents near The Hammocks, The Crossings, Three Lakes, and Country Walk. Locals will recognize our facility directly north of Miami Executive Airport across from Beckman Coulter corporate campus. We're also accessible for residents of nearby apartments, such as Cascades at The Hammocks, Lago Paradiso at The Hammocks, Vista Lago at The Hammocks, Hammocks Place Apartments, and more! 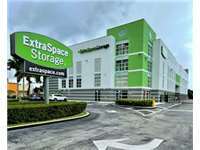 Do you need a storage unit close to Miami Executive Airport? Extra Space Storage is about 2.1 miles from the airport and offers climate-controlled storage, vehicle storage, and more! Extra Space Storage on SW 147th Ave. can accommodate a wide range of residential and commercial storage needs with a large selection of storage units and convenient amenities like climate control and vehicle storage. We're your go-to solution in The Hammocks! No matter what you plan to store, our Miami storage facility has the space you need! Storage units range in size from 5x5 to 15x20 and come with features like indoor access, first-floor access, and drive-up access. With advanced security measures like an on-site resident manager, 24-hour video surveillance, security access to your floor only, individually-alarmed units, and electronic gate access, you can store valuable belongings confidently and with peace of mind at our SW 147th Ave. storage facility. Climate control keeps your unit between 55 and 80° year-round, protecting sensitive items from Miami's heat and humidity. Climate-controlled units are available in sizes 5x5 to 15x20. Need secure vehicle storage in Miami? Extra Space Storage offers 10x10 to 10x30 drive-up units and 8x20 outdoor parking spaces to handle vehicles of all sizes from small motorcycles to large RVs. At Extra Space Storage, we're dedicated to high-quality self storage and reliable service. From our clean, secure facility to our friendly, professional staff, we'll go above and beyond to ensure your self storage experience with us is positive. Contact us today to reserve a storage unit in Miami! So far a great experience. Fantastic customer service! super clean place,nice temperature,super convenient access time and very friendly customer service guys. Quick, easy, respectful, friendly. Doesn't get better than this. The extra Space team at 147 ave and 120th st in Miami Fl is an amazing team. Great customer service! Friendly, clean and very understanding!! This is a great place to kerp your property safe.its clean, easy to access and very frienly and professional . Rented a storage space at 11851 SW 147th Ave Miami, FL 33196 for $185 they raised it without notice in 6 months to $212. Now again, raise it to $236 without notice. I would NOT recommend this place. We have the storage for over a year. You would think they would give you a break in the price since we have been loyal customers with no incidents. Excellent customer service! Secured and very clean location! I can describe the Extra Space Storage that I used in one word: Perfection. The building is impeccable, modern, extremely secure, well-designed, pleasing to the eye. The temperature is perfect, and the air is clear and fresh. The floors are beautiful and clean. There are always carts available. Extended hours. Very clean. Staff is friendly and helpful. Great location. Would recommend to family and friends. Extra Space Storage is very well laid out, clean and professional staff. EXCELLENT AND SECURE PLACE TO STORE YOUR PERSONAL AND BUSINESS ITEMS. Great facility, clean and excellent location. Price is also best in my area. This storage facility is clean, great customer service, and a good price! I LOVE THIS LOCATION!! THE STAFF IS SUPER HELPFUL!!! THANKFULLY FOR STEVE I WAS ABLE TO LOCK MY STORAGE!!! I BROKE MY KEY IN THE LOCK SO HE HAD TO GO ON A MISSION TO BREAK IT SO HE DID!!! HE SAVED ME DIDNT EVEN CHARGE ME!! I APPRECIATE HIS HELP SO MUCH DIDNT EVEN GET UPSET BECAUSE OF THE MISSION I PUT HIM THROUGH DIDNT MAKE FACES ALWAYS WITH A SMILE I KEPT SAYING SORRY HE SAID DO NOT EVEN WORRY ABOUT IT HE LEFT EVERYTHING SUPER CLEAN !!! I HAVE A STORAGE ON ANOTHER LOCATION AS WELL AND I AM DEFINITELY MOVING EVERYTHING TO THIS LOCATION. THANKS STEVEEEEEEEEEEEEE!!!! Great space friendly workers and helpers elevators worked fine very good security i love the fact that you need to put a code in the elevator in order to go to your storage over all it was a very good storage place and i reccomend it to everyone! So far I have no complaints. The facility, the personnel, everything is satisfactory. Thank you for storing my stuff! My stuff is happy! The staff here are the nicest and most helpful people. I have to say that it is definitely worth to pay a little extra maybe to store your things here instead of any Public Storage location. The facilities are kept very clean here and you can actually see inside the units, unlike other outdated storage places. I give this storage location an A+++. Very nice and clean storage. Price is lowest in the area. Staff is very nice and helpful. I already recommended 2 friends. They both love it. After having gone to another extra space the manager of the building at 10760 sw 186 st miami fl 33157, it proved to be a inconpetent and without any talent as a costumer service. I found the extra space in 11851 sw 147 ave miami fl 33196 thanks to good service of customer support by phone .... in that new building the manager and an employee helped me for my loss. if I have to recommend a place, its this storege with Jennifer and her team of employees with good manners. Jennifer wants the best for both parties and that is the door to more customers. Thanks again for your help Jennifer and staff. This place is the best. The rates are good the staff is great and it has what you need to get your items stored without any hassel. The location is clean. Friendly people floors are outstanding. From the moment i made that first phone call, to the walk through to see the facility, to signing the documents and to my recent exit the staff was wonderful and courteous. This storage facility is VERY clean, the AC is always on, is a very secure place with cameras everywhere and the office staff is always there to answer your questions. I rented two units for a very good price compare to other storage locations; so i saved a lot of money. Extra space management, the staff you have are absolutely very well mannered, amazing and they go above and beyond to make sure that your company is very well known and respected. Thank you for everything and you will definetly have me as a customer again in the future. Entrance & Exit control is excellent and convenient. The entire facility is spotless clean. Excellent elevators, good automatic lighting system throughout. Individual storage doors easy to open & close. Excellent service. Very helpful and helpful in explaining prices and lot sizes. Very satisfied with the service. All questions were answered and staff was very helpful!